All staff and students in the District’s Directory Service will have accounts created within School Loop automatically. However, these accounts must be activated before users may log in. In the case of non-teaching staff, the user’s role must also be specified during the activation process. Note: These instructions are specifically for districts using Directory Services Integration. Principals, assistant principals, and system admins all have the rights to activate user accounts. Look for the Activate Users menu located near the top of every page in your administrator account. 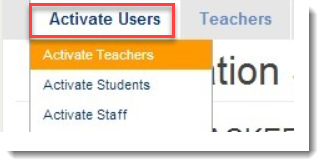 Click the option for the group of users you wish to activate: Teachers, Students, or Staff. To activate teachers or students, check the box next to each user’s name to be activated then click the blue Submit button. 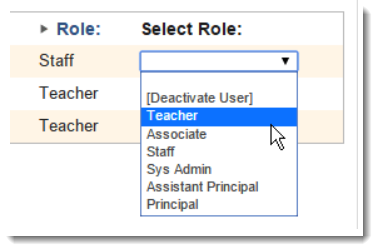 To activate Staff accounts, choose the appropriate role from the drop menu to the far right of each user’s name and then click the blue Submit button. This form also allows you to deactivate user accounts. NOTE: While it is possible to manually register users for any of these five roles, only the Associate role, designed for non-district employees, may require manual registration. The process for account activation for Standard schools is nearly identical to the above instructions but simplified. 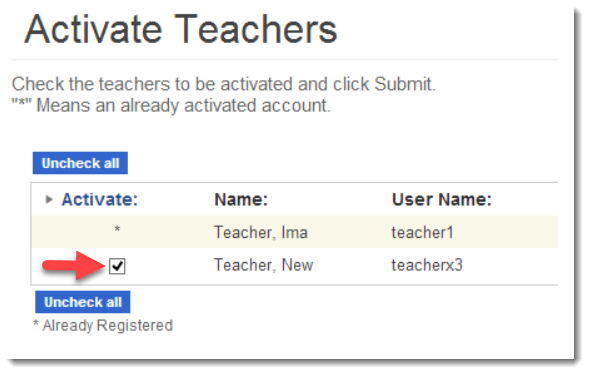 All users, teachers, staff, and admins, will be listed on the Activate Staff page. For each user, select their role from the drop menu (as pictured below). As needed, you may use the same process to change the role of a user or deactivate accounts.